The bible of vegetable gardening in the San Francisco Bay Area has been revised and updated! 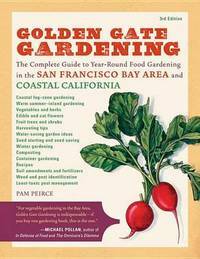 Packed with more than 400 pages of reliable information, Golden Gate Gardenin offers encyclopedic coverage of gardening principles and practices specific to the Bay Area and the Northern California coast. Author Pam Peirce explains strategies for growing common favorite vegetables and herbs, plus unusual ones that bring variety to the garden. She includes information on organizing a garden, dealing with pests, assessing a microclimate, cultivating fruit trees, gardening on a rooftop, harvesting the crop, and creating delicious gardener's dishes. This third edition also contains new or updated information on resources for specific seeds, tomato planting, organic gardening, and vegetables not included in previous editions, including amaranth, shell beans, Chinese broccoli, broccoli raab, Florence fennel, oca, okra, and quinoa. Charts, sidebars, maps, and online resources help make the vegetable gardening experience easier and more fun. Pam Peirce is also the author of Wildly Successful Plants- Northern California. She writes the Q&A column "Golden Gate Gardener" for the San Francisco Chronicle and teaches gardening and horticulture at City College of San Francisco, where she lives.